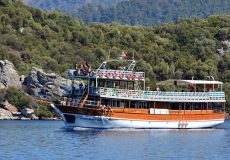 You can see the available dates for Marmaris Boat Trip (All-Inclusive). Please use the booking widget to make reservation. Wait no long! 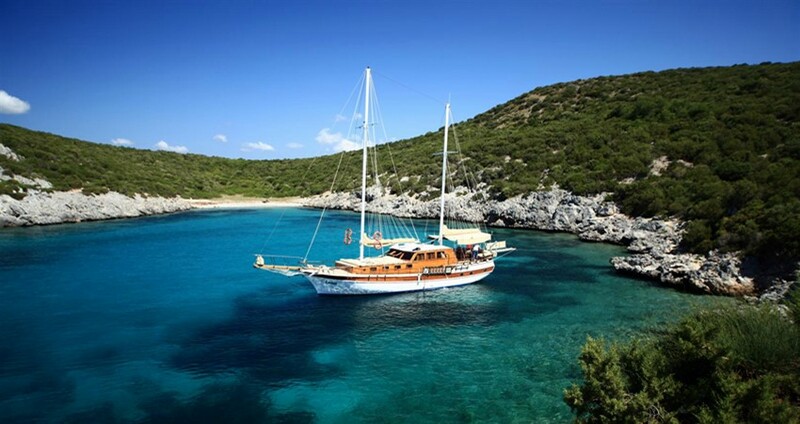 Your dream Boat Trip in Marmaris is about to start now. 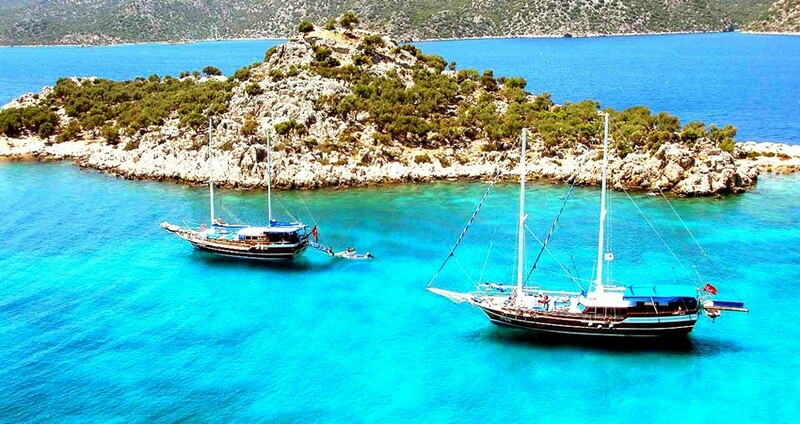 We offer relaxing Marmaris Boat Trip at an affordable price. We arrange for unlimited drinks onboard along with a luscious BBQ lunch. You can pick from the beverages such as tea, coffee, or soft drinks like (Cola, Fanta, and Sprite) and local wines or draft beer. 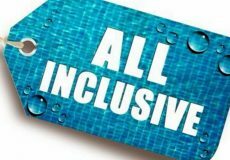 All drinks onboard are for free and you can relish them all along the day as you lay back on your sun-bed underneath the clear and shining light-blue sky. 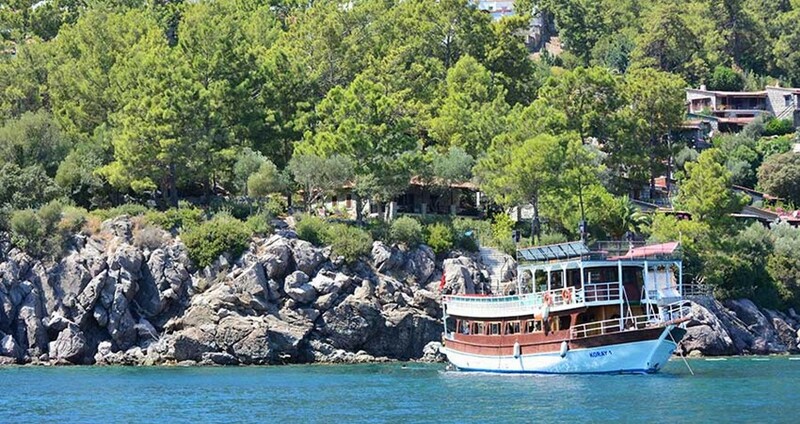 On Marmaris Boat Trip, our tour plan includes a visit to the neighboring islands and bays around Marmaris. 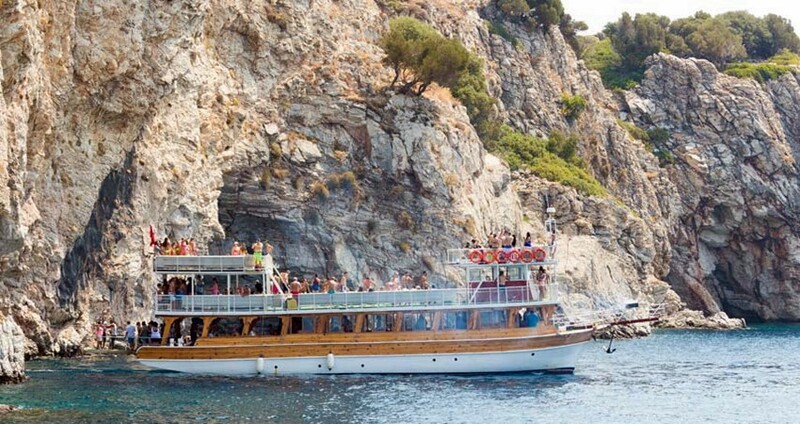 The tour includes picking you up from the hotel, all day boat trip, stopping at calm and serene bays. 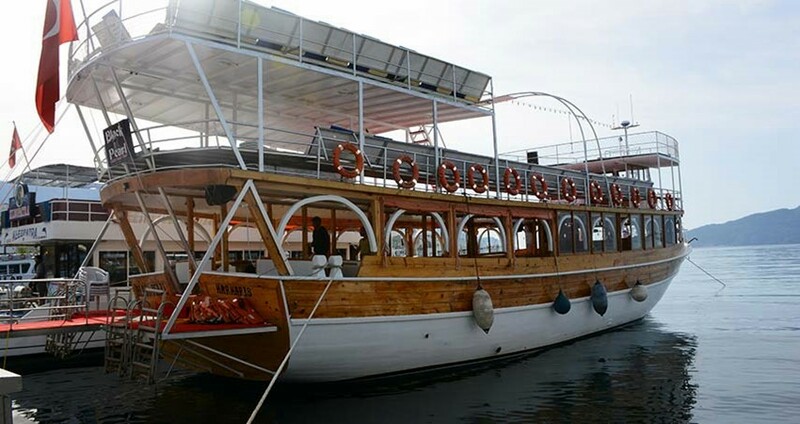 Marmaris Boat Trip provides you an opportunity for snorkeling, swimming, sun bathing, having a lot of fun and an unforgettable day you’ll remember for long. The journey begins with a free transfer from your hotel to the harbor. After which, we begin sailing in the Mediterranean Sea under a clear light-blue sky and an infinite sight of clear water ahead. 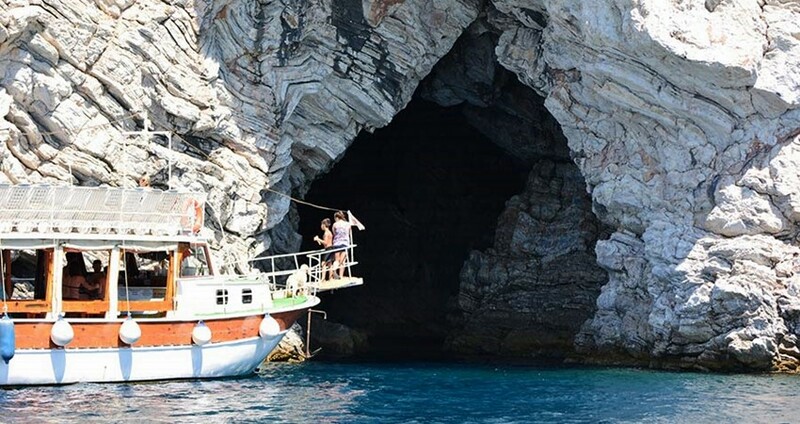 The route that we follow is; Heaven Island & Fish Farm, Aquarium Bay, and Phosphorous Cave also known as the Wishing Cave, Kumlubuk and Amos, Turunc Village, Green Sea and return back to Marmaris. We have a fleet of the best-kept boats in town. All our boats have 3 decks; the top most deck has got sun-beds. The rest of the decks have tables, chairs and enough space in the shade. All our boats are well-maintained and equipped with modern amenities with showers, toilets, etc. Our boats are equipped to serve you unlimited drinks all day along with a delicious lunch of BBQ, chicken, salad and pasta. Our friendly English speaking crew is always ready to help you with any problems on the boat. You can borrow life jackets and noodles available on each of our boats. We keep them ready for our visitors, especially for those who can’t swim. We have music and entertainment all day onboard. Please let us know while you book our services if you don’t have a liking for big music, we can easily arrange your place in one of our quiet boats. Unlimited Soft Drinks (Fanta, Cola, Sprite, Water, Tea, Coffee), Unlimited Alcoholic Drinks (Draft Beer, Local Wines, Vodka), Lunch (BBQ Chicken, Salad, Pasta), (English Speaking) Crew, Full Insurance, Hotel Transfer. 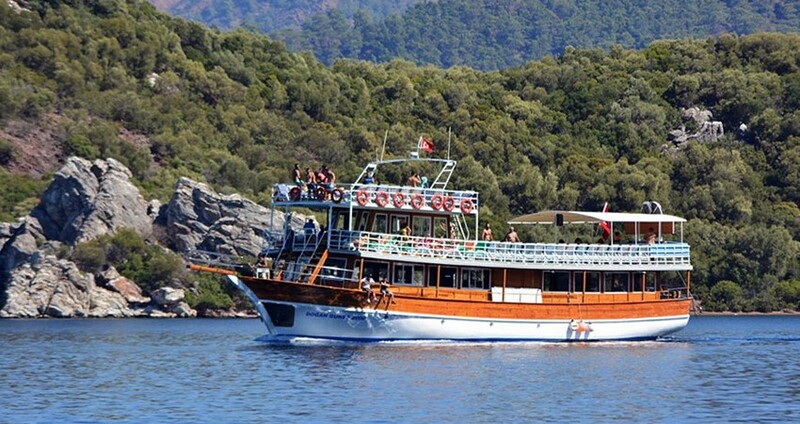 Join our all inclusive boat trip from Marmaris. 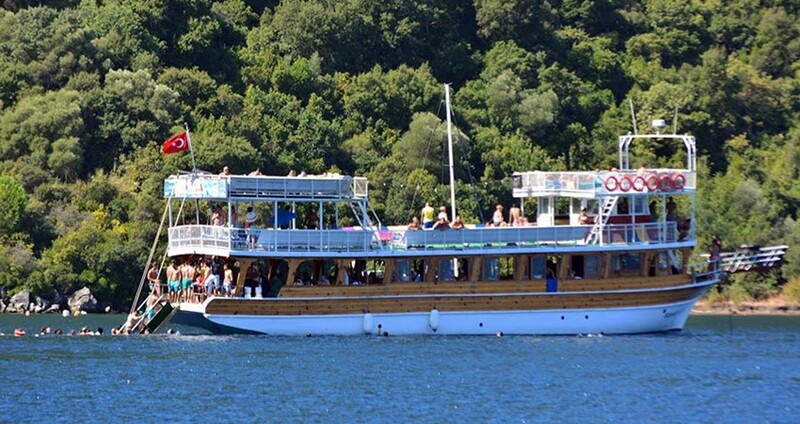 Our boat trip is coming as full package with unlimited drinks & BBQ lunch. A day to relax and enjoy the sun shine. I booked this boat trip online for the previous day but had to cancel in the morning because my girl friend was sick. Marmaris Travel let us rearrange the tour 2 days later for free of charge which was very kind of them. When ever i have questions, they response to my queries within seconds. Thank you very much and keep up the good work. While we are in Marmaris, my friend was looking for a deal for a boat trip and he found this website. I was like, lets give it a try and see how would be the experience. The sea was calm, and the view was amazing, the BBQ was also perfect. 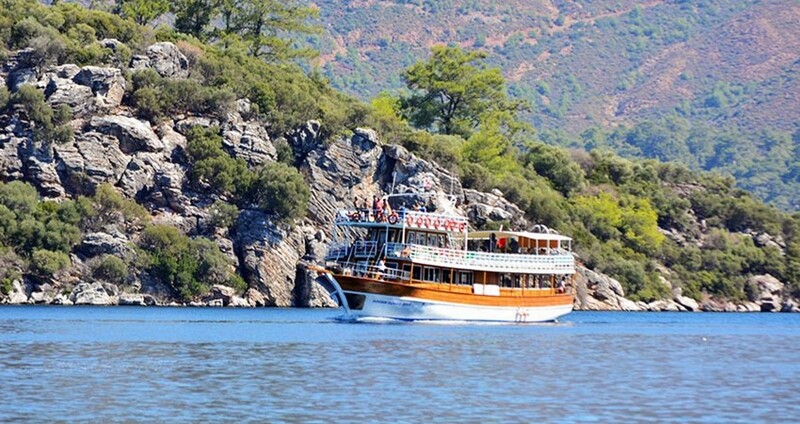 I recommend you to take a boat trip while you are having your holiday in Marmaris!!! Oh wait, I forgot one thing, UNLIMITED DRINKS!!! all day long. Our boats have 2 or 3 decks, so downstairs we have enough shade. No need to worry. 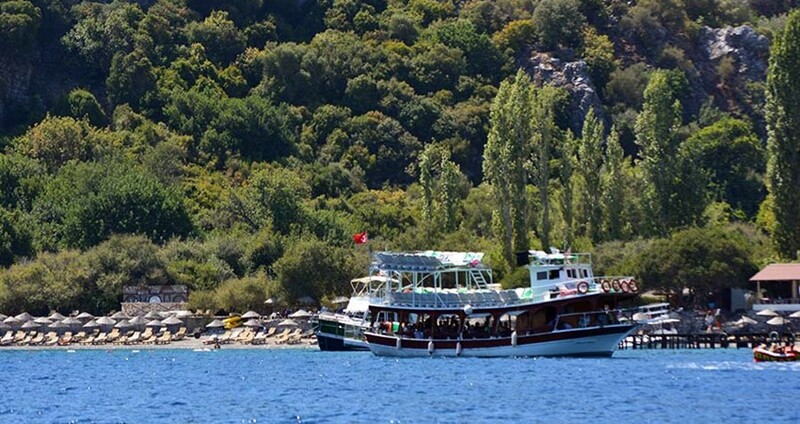 Around 10:00 am in the morning our boats will depart from the Marmaris harbor. Our first stop is the place named Heaven Island. It’s also famous with the fish farms around; you can feed the fish and its fun. Aquarium bay is famous with the green surrounding and crystal-clear waters. This is our first stop for swimming and the break lasts for half an hour. Phosphorus cave, also known as the Wishing Cave is something special where the waters change colors through the day! People drop coins in the water and make wishes. It’s said that wishes made here come true. Amos & Kumlubük is a popular and well know bay around Marmaris. This place is a prestigious ‘Blue Flag’ holder, an honor conferred for the cleanest sea waters and beaches. We have a swim break here too. And our BBQ lunch is ready to be served here. Turunc is a small town near Marmaris. During our boat trip, we pay a visit to this interesting town. You can stroll around and explore this town; have a drink in the cafeterias on the sea front. You can also swim at the Turunc beach, which is also Blue Flag holder. On Mondays there is the local market in Turunc; people who would like to do some shopping on a local market can join this tour on Mondays. This is our last swim stop on this tour; we have half an hour’s swim break here. The waters and the nature around here are so appealing and serene. At the end of the day long Marmaris Boat Trip we are back in Marmaris at around 16:00 pm. We arrange to drop you back safely and comfortably in our well-kept vehicles to your place of stay. 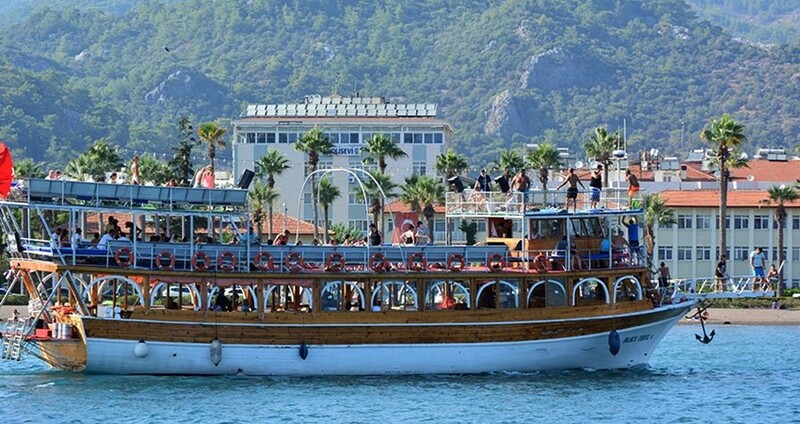 Some of the important facts and useful information about " Marmaris Boat Trip | All Inclusive "